Welcome to the Belmont Inn - an historic Inn, listed on the National Register of Historic Places, located on the square in Abbeville, SC. The Belmont Inn features 25 guest rooms, Breakfast room, Conference Room, Gift Shop, Paw Spa, Vending area, "Tinker's Alley" Bar and Grill, as well as a Main Dining Room. The Inn celebrated its 100th year in 2003! During the early years, The Eureka, was a center of activity housing railroad visitors and travelling troupes that played The Abbeville Opera House. Recently, in 2015 the Inn gained new owners who are diligently working on bringing the hotel back to its former glory. 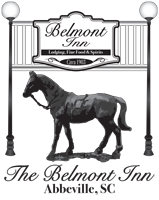 The Belmont Inn is the perfect setting for a weekend getaway, opera play, weddings, receptions, family or high school reunions and numerous other events. ambiance of a bygone era. Take a stroll through the historic square, visit the quaint shops, dine at the Belmont Inn and see a great play at the Abbeville Opera House.